HSU's TRiO Education Talent Search program is excited to announce the launch of their brand new Canvas (not-for-credit) online course! Anyone can work through the course, whether you're a participant in our program, a parent of one of our students, or anyone else! Click the "Shape Your Future" graphic below to check out the course. Make a Web Grants 4 Students account NOW, if you haven't already. *After graduation, CONFIRM High School Graduation. Check all of your college portals and your email regularly. Accept your financial aid through your school's portal. *Accept all the FREE aid first. *Once you know about scholarships, you can go back and accept loans. *Remember, BORROW AS YOU GO, AND ONLY WHAT YOU NEED. Apply for as many scholarships as you can! Check out our Financial Aid page for resources. Attend your school's Orientation over the summer. You'll meet with advisors, learn about the school, and sign up for your classes if you haven't already. Work over the summer and save as much money as you can. *Every dollar saved is a dollar you won't need to borrow. 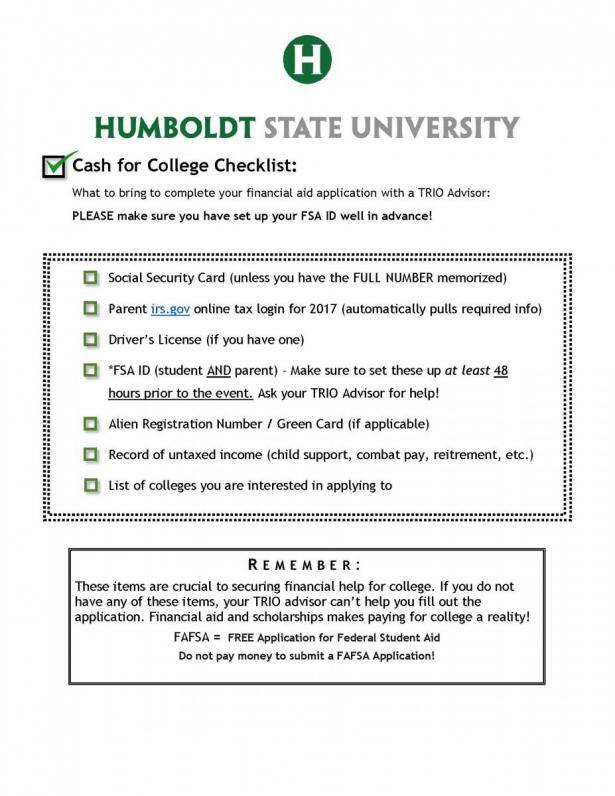 Use the checklist below to make sure you have everything you need to fillout the financial aid applications. To get to the FAFSA Website, click here.